Retirement must haves? you're looking at a picture of our bedroom... the nautical term is berth, in this case Vberth since it was at the bow... the pointy end... of our sailboat. When we moved from our large two-story comfortable home, it was full of stuff... stuff that we thought we just could not live without... boy were we wrong. 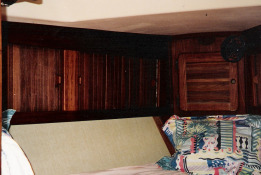 All of the clothing that we wore is stored behind the teak sliding doors that you see pictured in our bedroom... straight ahead was the anchor locker. Since we had the good sense to pick the Caribbean for our sailboat cruising lifestyle we required shorts/swim trunks and T-shirts for me and bathing suits and cotton coverups for the first mate. We both wore waterproof sandals, floppy hats and sunglasses. This totally replaced our closets full of suits shirts ties dresses blouses and more pairs of shoes and boots than you can count. The boat fulfilled our needs of shelter, transportation, cooking and entertainment... what else do you need? Leaving for a new life on the boat, we sold all of our electronics, TVs, stereos, computers, etc... when you think of how fast technology changes everything would've been obsolete within 18 months anyway. That was one of our smarter moves. We had a garage sale to get rid of the nonessential furniture, yard stuff, etc..
What we kept was mostly our teak furniture that was easy to disassemble, pack and store. All of the belongings that we stored during our time on the boat fit easily into a storage space 15 x 10'. When we did get our stuff out of storage eight years later and started unpacking...it was like Christmas with each box containing keepsakes and memories. Never once did we say, I wish I'd kept such and such. When you get right down to it really the only thing you cannot replace are the pictures that you taken over the years...Your retirement must haves should focus more on good health and the experience of retiring. Some other stuff that we did not keep was our mattress and box springs. We either sold or donated items like bedding. Stop and think how much technology in beds and mattresses has improved. One of the first things...DUH... that we bought we moved into our new house was a new mattress. On this we did not skimp... remember you spend a third of your life on your bed, cutting corners on a mattress is a foolish savings... we bought a Temperpedic mattress and have never regretted the extra money that we spent on something that we use every single day. Are you beginning to understand that your list of retirement must haves does not have to be extensive?